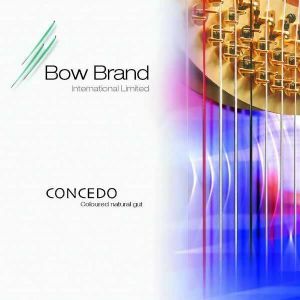 Bow Brand's premium Concedo White Gut strings in 'Lever Gauge' which are suitable for lighter stringing on Grecian and early pedal harps. Slightly lighter in the mid range than the 18th Century Gauge. I have listed the diameters for each string. The price listed for a Full Set from 1st Octave D to 5th Octave F ( for Grecian Harp ) includes a 10% discount. If you require the Top G, Top F and 1st Octave E, you will need to order these 3 individual strings in addition to the full set. You can email to arrange a similar discount if you require a Full Set covering a different range.